Relatively shallow and light underground structures, such as urban tunnels, may cross liquefiable sand deposits and liquefaction has induced floatation and large uplift to sewer pipes or open-cut tunnels in some recent strong earthquakes. It is worth noticing that in urban area shallow tunnels are likely close to the foundations of buildings and easily interact with them during earthquakes (i.e. Soil-Structure- Underground Structure-Interaction, SSUSI). Nevertheless, the reciprocal influence of a tunnel and an adjacent building in presence of soil liquefaction has not been investigated in the literature yet. This problem appears rather important considering the rapid extension of the built environment, both above- and underground, to areas that may be subjected to seismic-induced soil liquefaction. The proposed research intends to investigate this problem through a series of centrifuge tests. These will be carried out on a reduced scale model of a typical case of a cut-and-cover tunnel in urban environment. A rectangular model tunnel will be embedded in a liquefiable layer of sand. A model building will be founded close to it. 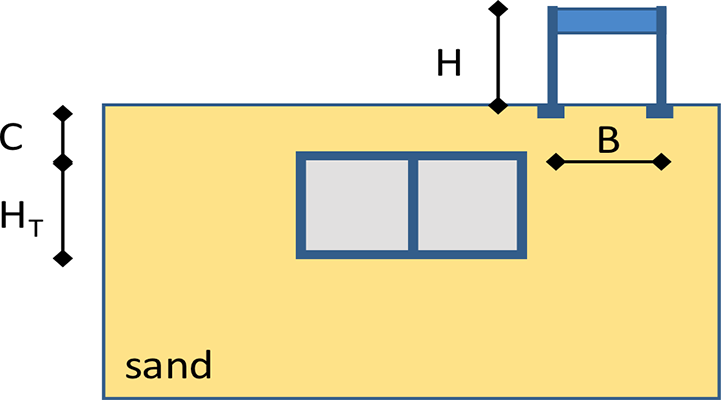 Furthermore, a possible remedial technique to reduce both tunnel and building movements will be modelled in some tests, by mixing a nano-clay to a volume of sand, either beneath the tunnel or the building, thus lowering the potential of soil liquefaction. The study will contribute to the wider topic of the resilience of urban environment to natural hazards, and to earthquake-induced soil liquefaction specifically.